SMART EGG LABYRINTH PUZZLE (SPIDER) Smart Egg labyrinth puzzle (Spider version) is another in the line of Smart Eggs, with this version being towards the simpler end of the spectrum. Spider features 1 layer, which means that it is very accessible – fun, simple and not very challenging. This represents a good entry point into ..
Smart Egg labyrinth puzzle (Spider version) is another in the line of Smart Eggs, with this version being towards the simpler end of the spectrum. Spider features 1 layer, which means that it is very accessible – fun, simple and not very challenging. This represents a good entry point into the range. The way it works is you get a thin rod, with rounded (thicker) ends, and the ‘Smart Egg’ itself, an egg shaped object, with holes and sliding tracks in it. You then have to insert the rod at one end, then move the rod through the puzzle until it comes out at the top. Like with all physical puzzles, there is a good degree of both dexterity usage and mental reasoning/deduction involved. WHO’S IT FOR: The Smart Egg Labyrinth Puzzle (Spider) version can be used by kids from about 6+, although it’s more likely to be a gift for adults perhaps. THE TOY VERDICT: This is a good entry point handheld puzzle. There are more difficult puzzles in the series, but this is nevertheless an entertaining and tactile product. 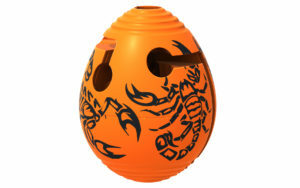 Smart Egg can be bought on the high street in the UK via Waterstones.